Jatin is one among the 108 names of Lord Shiva. It means ‘one who has matted hair.’ The mantra with Jatin is ‘om jatadharaya namaha’- Obeisance to Lord Shiva who is with matted hair. The matted hair of Shiva is mentioned throughout the Puranas and the epics. The mighty Ganga could not flow on to earth because her fall to earth would have destroyed it. When Ganga falls, Shiva captures her in his matted locks. Shiva receives Ganga on His Head one of the one thousand and eight names of Shiva is Gangadhar, that is, the holder of Ganga in his matted locks (Jatin). Bhagirath did severe penance and austerities to make Ganga descend on the earth from heaven. He wanted to free his kinsmen from the curse of Rishi Kapila. And this could be achieved only if the holy and heavenly river Ganga cleansed all their sins and moistened their ashes. Brahma pleased with Bhagirath's tapas granted him the boon. But then how can the earth survive the mighty fall of the Maa Ganga. 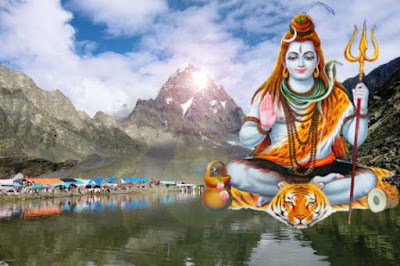 Shiva then told all living beings that He will receive Ganga, the daughter of the king of mountains, on his head and thus pave the way for the redemption not only of your ancestors but all human beings. Lord Shiva caught her on his brow and checked her turbulence with his matted locks to save the earth from the shock of her fall. Ganga descended from Shiva’s matted locks as seven streams. Shiva also holds moon or Chandra in his matted locks. Chandra rejuvenates on the matted locks of Shiva. Chandra was cursed to disappear but Shiva turned the curse into an advantage. He gave Chandra abode in his matted locks and thus we now have the waning and waxing phase of moon.